Target recently offered some new beauty boxes that are available only in your local Target store. This is a review of the in-store only In Your Skin Beauty Box. Every month, Target also launches a beauty box online, and it usually sells out very quickly. If you want to make sure you don’t miss out on the next Target Beauty Box, make sure to sign up for the My Subscription Addiction daily newsletter! 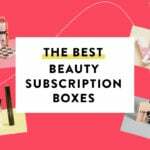 Check out all of the Target Beauty Box reviews and the best cheap subscription boxes! Here is the info sheet for the box. Pixi is one of my favorite affordable skincare lines, and I have been wanting to try this rose tonic since rose really agrees with my skin. This did not disappoint, and I was happy with its performance as a hydrating and soothing toner. Along with rose water, this also has aloe, rose extract, chamomile, and elderflower extract. I am firmly not in the natural deodorant camp, but I gave this a try because I liked the light scent of lavender and rose. This did absolutely nothing to disguise my sweat when I worked out, so I would probably only throw it on when I am relaxing at home with no plans of physical exertion. This is aluminum and paraben-free, but it does have baking soda in it which can irritate sensitive skin. 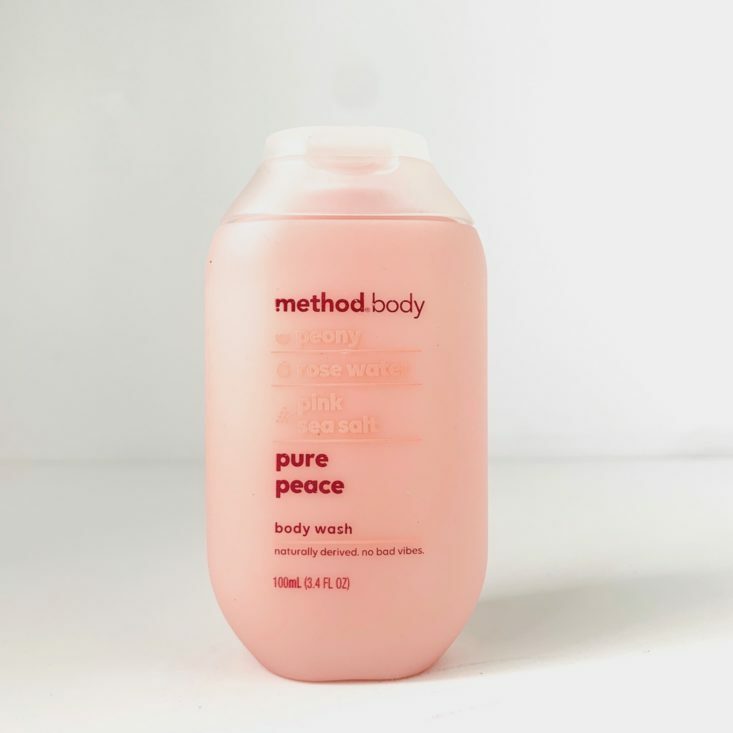 This body wash is the perfect travel size, which is perfect since I will be taking a short overnight trip next week. The scent is a delicate blend of peony, rose water, and pink sea salt, and I like that this doesn’t leave my skin feeling stripped or like there is a residue. Plus, the bottle is made with 65% recycled plastic! This tiny perfume-vial sample contains a new face mist from Garnier featuring ingredients like rose water and glycerin. I like that Garnier is making an effort to show the sources of their ingredients, but I wish the ingredients list did not have alcohol denat so high up. That being said, I put this to the test after a workout, and I was happy with the performance as a refreshing, soothing mist. Considering with the included coupon the full-size version of this mist would be under $5, I just may pick it up. This moisturizer is made with shea butter, beeswax, and rosewater to soothe and nourish your skin. Depending on the amount you apply to your skin, you can use this as a day moisturizer, a night cream, or even a mask. I chose to wear this as a hydrating mask, and I was happy with the boost in moisture this gave my skin. This would probably be too heavy of a day cream for oily skin, but it should work as a night cream for almost anyone. The Verdict: My skin loves rose as an ingredient, so I was excited to try this kit out. While as a whole I was happy to try things out like the Pixi rose tonic, the value of this box is less than what I paid for it with a total value of $6.07. If you’ll use the included coupon than the value goes up a tad, but I do think Target could have included either another sample or bigger Garnier samples to make the box worth at least the cost. Can you get this box if you sign up today? This box is only available in-store, so I recommend giving your local Target a call. Value-Breakdown: At $7 for this box you’re paying $1.40 per sample. What do you think of the Target in-store “In Your Skin” Beauty Box? I mean I purchase deluxe size samples I got to buy them but there inexpensive and I. An choose what I want what works for me , not some box put together of one time use products and stuff I won’t utilize. Not all targets have them but the one I adore is the one about 15 min away and they have like a huge round bin with all great deluxe size samples , I feel like a kid in a candy store , I can try different things before I purchase a large one and If I don’t like the deluxe sample size I just return it . Works for me . Target has some decent products just need to know your prices , and they have stuff online I’ll just get delivered to the store for free bc sometimes online it’s cheaper . Yes, I had to go through a detox period too. I never found a “natural” deodorant that actually worked until I was gifted an infrared sauna (yay for hand-me-downs). A few nights of massive sweat sessions and I found that I stopped smelling so rank (even without wearing deodorant/antiperspirant). Also, aluminum doesn’t stop you from stinking, it actually clogs up your sweat glands and prevents you from sweating altogether. When you sweat, the bacteria reacts with the air and causes the odor. That’s why aluminum deodorants are called antiperspirants. Natural deodorants let you sweat (you have to get used to the wetness factor too if you switch) but have ingredients that minimize the odor from the reaction. There are still some natural deodorants I’ve tried that do not work for me (Love & Planet, Jason’s, the crystal stuff) but I’ve found that Schmidt’s and Native are effective for me. I guess I should compare what the ingredients are and stick with the brands that have those. And, if I don’t keep up with my detoxing (over a week without a sauna/working out and/or I eat too much meat) I do notice the natural stuff will stop working faster. I am one of those who has also tried to switch to a deodorant instead of antiperspirant/deodorant. I have only found one, by pure accident, that I did like better than any other but I never could get used to the whole sweaty armpits. The brand is Lavanila. I do use their fragrance. You can get everything in matching fragrances. Although I still use aluminum antiperspirants, washing that off is actually part of my nighttime routine along with washing my face. No words to describe how bad this box is. I have gotten the Garnier free three times. It’s a free sample. Period. Maybe time for Target to end these boxes. The in-store boxes last year were SO amazing that I bought 2 or 3 of each because they had 5-7 items. This one is so bad. WHAT HAPPENED? Target….are you reading this??? I haven’t found any Pixi item that I like. None. This stuff included. I have received the Native deodorant free, twice, from PinchME, and enjoy it. It has been good for the cooler months, at least. I got the both the pixi toner and the Garnier moisturizer as free samples at my local target. I get them for free as well. 🤣 lol JuJu idk about all that , I’m just saying it’s not worth it to me since I’m not gonna use foul packets and that deodorant , yeah I do think it’s a rip off I mean those aren’t even travel size ! So in my eyes a complete unfair value . I do better shopping in their travel size bins and get great products for value . Also Walmart’s beauty boxes the glow set, the eyes have it , and the hair were all full sized products for $9.95 now that’s value to me and there NOT budget brands 🙂 so props to Walmart this time around, target needs to step it up a lot ! Anne, I was responding to what Jessica said at the end of her review. Yeah, the per ounce broken down price is because you pay less for larger sizes. If you actually had to buy the samples separately from Target, you would be paying more since I saw that Pixi tonic for $4.50 and the Native is $2.99 at my store. Well, I mean, that’s how the value for all the beauty boxes is calculated, and I don’t believe I’ve ever seen a value lower than the price. That means this box is even worse than I initially thought. The deodorant does not work BECAUSE it does not contain aluminum. Aluminum is the stench-quenching factor. And no, aluminum does NOT give you Alzheimer’s. Agree that the Pixi rose toner is fantastic! You may need to detox yourself from the aluminum deodorant for the natural to work. It takes about a month. I am quite happy I made the switch, my clothes don’t stink anymore like they did when I was using aluminum deodorant. I used to only be able to wear cotton, it was the only material that would get rid of the smell in the washer. My body is sensitive to aluminum, but yours may not be. I used Schmidt’s and it worked (for me) from the beginning of the detox. I’ve never tried the native brand. I have an office roommate who only uses natural deodorant (I dont know what brand since she didn’t tell me) and tries to get some exercise in during her lunch breaks. She thinks her deodorant is working well for her, but I have some other opinions and have needed to keep the window open throughout the winter. I really cant wait for this natural deodorant trend to die. Exercise during lunch breaks can cause a problem with any deodorant! Thank you for your comment. I attend a lunchtime yoga class – but I usually take the time to shower afterwards. I even wash my hair since it is thin & dries quickly. I hope the shower does the trick! Exactly. I think people think they “adjust” to their natural deodorants when really they just go nose blind to the smell. I’m pretty sure my fiance and my daughter would have some opinions if I smelled bad. We are never shy about telling each other if we’re gross. I sure I notice when my deodorant fails, I’ve never been nose blind to myself…but I usually keep wipes and a travel size in my drawer at work. Natural deodorants never last as long as aluminum either, they work for a few hours and so you have to account for that if you want to switch. That is the silliest thing I have read on here. If I even mildly pit out I can smell it, even when I used the crappy old, won’t let you sweat, pore plugging stuff. My husband and 4 children have zero issues letting me, or anyone else that they know, in on the fact the are stinky too. In fact, the only two people in my house that use antiperspirant are the only two that pit out and are trying to find stronger and stronger stuff. Just because it doesn’t work for you does not mean it doesn’t work for everyone. Natural deodorant is not simply a fad. I along with many others have been using it for years and years, myself since 1998.